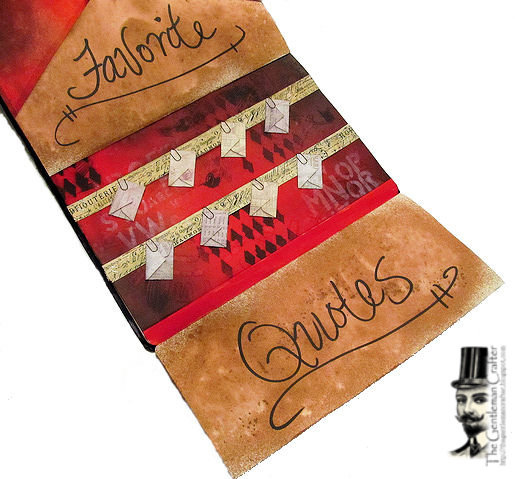 The Gentleman Crafter: Quote Page! Hope Thursday was a good one for you! We had a rainy night here last night and heard about the terrible news in Granbury, Texas before bed! Our storms actually came around 3:00 a.m. as I woke by hearing the hail on the tin roof. My immediate thought was my car, but by the time I made it out of bed the hail had stopped but HEAVY rain, thunder and lightning soon took it's place. It turned out to be a beautiful sunny day this afternoon. OK, Tonight I wanted to share with you all a page I did in my art journal for Inspiration Emporium. This month's challenge is all about the quotes! So I thought I better get started and get my projects done. I sprayed the background page with Dylusions Postbox Red (get it?) and Black Marble Ink Sprays. I then used the large Dylusions Letter Jumble stencil with Dylusions White Linen Spray Ink for a little background noise. I then used the Black Marble Spray Ink with the Dylusions Diamond of a Border stencil for just a bit more background action. With that done, I cut a 12 x 12 piece of Manila Cardstock in half. I scored the bottom and top 1/2-inch in from the top piece and again on the bottom piece. I applied Scor-Tape to the fold and adhered the bottom piece to the journal page. Next, I found the center of the top piece and used my craft knife to form the "Envelope Flap." I then added the Scor-Tape to the scored edge and adhered that to the top of the journal page. Last, I sprayed both the front and backside with Dylusions Melted Chocolate Ink Spray. 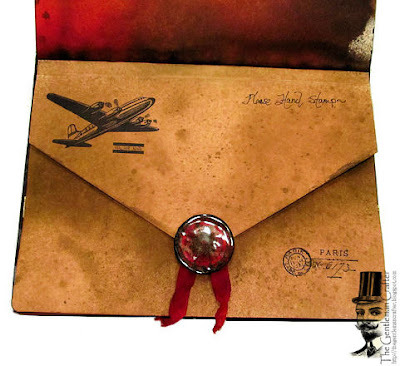 I added some of Tim Holtz Stampers Anonymous stamps to the front in Archival Ink. 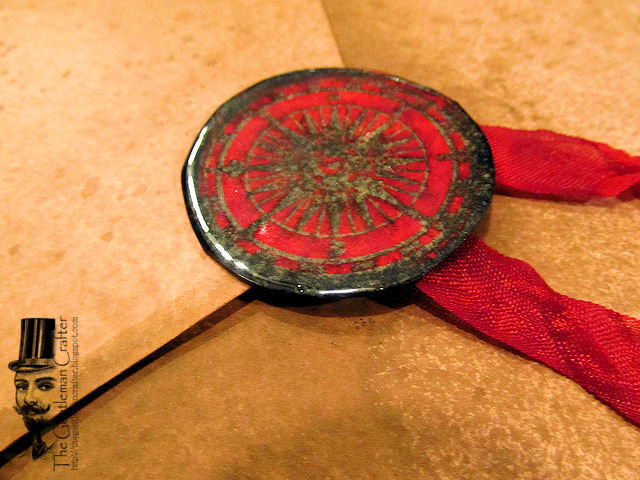 For the seal, I stamped the Tim Holtz Compass to Manila Card with Embossing ink and added Black embossing powder. When that was done I cut the compass out and added more embossing ink and dipped it in UTEE three times to build up the layers. I sprayed some Crinkle Ribbon with Dylusions Postbox Red, dried it and adhered that to the back of the seal. I glued the seal to the envelope flap. 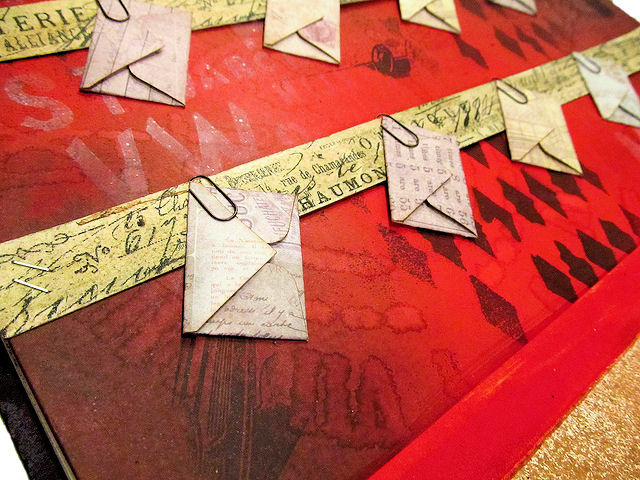 Back to the inside, I taped two strips of Tim Holtz Tissue Tape to Manila card and cut the strips out. I used the Tiny Attacher and stapled the strips to the journal page on each end. I also added a bit of the Dylusions Melted Chocolate Ink Sprays with my finger to age the strips a bit. Last, I used the McGill Mini Envelope Punch (I believe this punch has been discontinued...Think about using coin envelopes or your We R Memory Keepers Envelope Punch Board.) and punched out 8 envelopes. 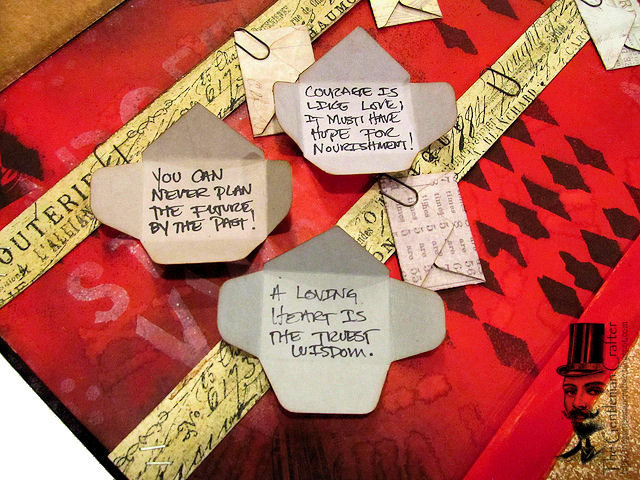 I added some quotes to these and folded them and placed them on the strips with Tim Holtz Mini Paperclips.....Done! Hope you like the page. It was a fun addition to my journal. Thanks For Coming By Tonight! See you tomorrow! Super clever!! And it's gorgeous too! I also love your dress form on the last post... I'm just catching up from being overly busy...lol... so I'm combining my comments. :) Glad you're okay from the storms! Very clever! Absolutely adore the compass seal. You are amazing, love it! Super cute! The seal is great! Slomomom lives in Granbury. I remember because I went to high school there and it is a tiny tiny town. Hope she is okay. Tonight's project is very clever, Jim!!! I thank God that the bad storms missed us...that was some lightening and thunder show early this morning...pulled me right out of the bed when it started with a LOUD clap of thunder. So glad you're ok.
What a lovely idea for saving your favourite quotes! The seal is fabulous! There is nothing about this that I don't just LOVE!! The "seal", the notes, the color, the texture, etc. Thank you thank you thank you for sharing!! Again awesome! I love your journal page, when I see pages like this I really want to get into art journals and I will one day. Very cool, Jim. Love it. i adore this! and i think it is a project i could actually make. thanks! I love the way you've turned the page into a folder! Very clever!!! A wonderful idea! Such a fantastic page for a journal!! A letter to ourselves to remember what is important in life! Very elegant and purely Gentleman Crafter! Love your designs and watching your Ustream shows! My prayers go out to all the people in Granbury,Texas!! Coolest design ever!!! I love the mini envelopes with the quotes all hung up! Oh to have your mind! L.O.V.E. it!! I'm a quote collector and enjoyed the ones you used. I'd love to see this made into a card. The colors you used are perfect. The "please hand stamp" stamp was a very creative addition, one that most people would have overlooked. The storms must be horrendous there. Aren't you glad you weren't in an airplane on your way home when they struck? My heart goes out to all those in Granbury, a place a friend used to live. Stay safe! That's fantastic! So clever & it looks wonderful. When you create a page and everyone wants to make it too, you know you've got a winner on your hands. Love it! 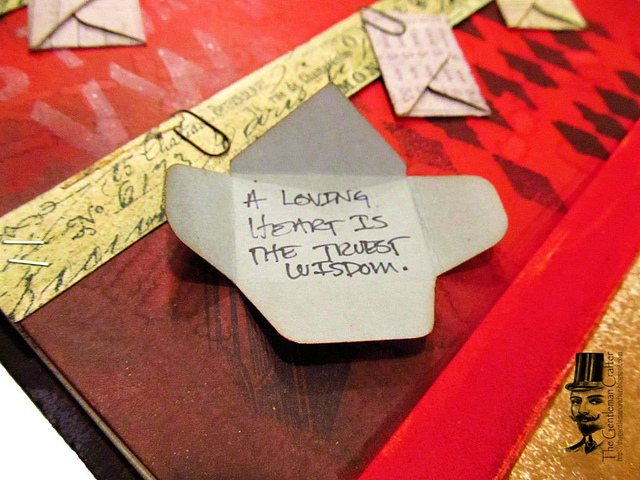 I collect quotes right and left and have them laying around the studio on little scraps of paper everywhere. Time to corral them on a journal page. I hope the tornados are done with Texas; they've done too much damage already. TGIF. Such a cool idea!! I had been thinking of making one of your previous projects and filling it with memorable quotes for my granddaughter. Now I'm thinking this manilla envelope idea (outside the journal, of course) might be a better idea. Love it!! Even though I rarely comment on your creations I follow you daily to see and read about your adventures, but I had to comment on this project because it is by far one of my favorites from you or most anyone else...there s something about this that really spoke to me. I love everything about it, the colors, the stamps, the layout of the page...I stared at it for quite a long time. I also have the small envelope punch that you used to write you quotes on. When I got it I was not sure that I would use it very often but I have and this is just another great idea. Thanks I really enjoyed this one so much. Omigosh, Jim! 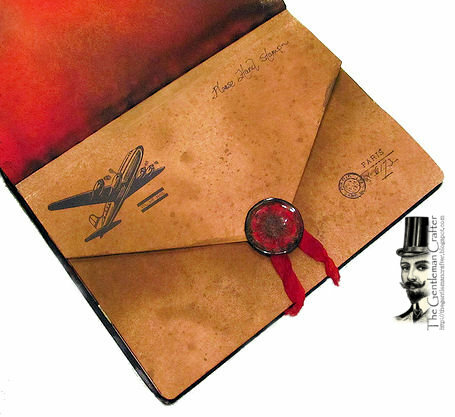 I love this one...the teeny tiny envelopes..the teeny tiny paper clips, the wax seal, the stamping...the colors...what a gorgeous, gorgeous interpretation of the challenge. One of my recent faves from you. Thanks so much for sharing! WOW!!! fabulous... luv the little envelopes with the quotes..is that your handwriting? and are those your quotes??? luv luv it all!!!!!! Wow... I love your page! Those tiny envelopes are fabulous! I hope that your car fared well after the hail storm!